Snowman Frame – Poetry Gift that will warm their hearts! Home » Blog » Snowman Frame – Poetry Gift that will warm their hearts! If you lived in a cold climate as a child, one of your fondest memories may be building a snowman. Lived down south as a child? Then you probably dreamed of playing in the snow and building a snowman. The kind of snowman found in books and movies; one with charcoal eyes, carrot nose, black top hat and red scarf. Even though they are made of snow, snowmen always conjure up feelings of warmth and happiness. 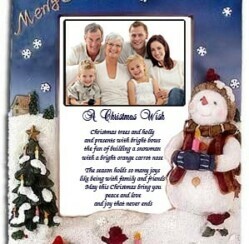 To recapture those feelings, PoetryGift.com offers a personalized Christmas gift of a whimsical snowman winter scene. Your wife, husband, parents, grandparents will love the combination of a personalized sentimental poem and favorite photo. Maybe a family photo that you would like to display in a unique way. The snowman frame is easily opened so that a photo can be taped to the back of the heavy weight parchment paper. Or you can order the gift without a photo opening. Free shipping for any Poetry Gift is available. 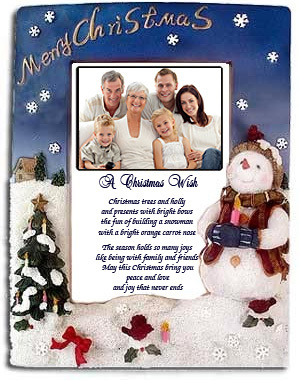 This holiday season give someone you love a heartwarming childhood memory with this charming snowman frame. When I was a little girl, one of my favorite things during winter was making snow men and having snowball fights with my friends. Those memories will never fade with time and this adorable snowman frame reminds me of all those happy time.